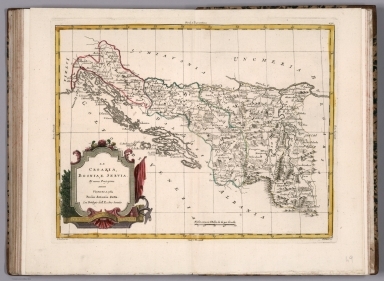 "Engraved hand-colored in outline, double-page map, with decorative title cartouche. Shows administrative divisions, cities, towns, rivers, lakes and mountains. Relief shown pictorially. Map no. in upper margin ""P. IV."" Zatta's atlas in 4 volumes, dated MDCCLXXIX - MDCCLXXXIV (1779-1784). The most comprehensive world atlas issued in Italy in the 18th. century, based on observations and discoveries made by the most famous and most recent geographers. Volumes 2-4 have full engraved title pages, including borders with geographical instruments and maps, seaside scenes at bottom with a large globe and several putti engaged in mapmaking and observation and a scene in the center. Vol. I, has decorated engraved title page/frontispiece, dedication text "" a Sua Eccellenza il Signor Carlo Spinola ..."" and index. Bound in half leather marbled covered boards with ""Atlante novissi. Venez, 1788 P.A. Zat."" stamped in gold on spine. 217 detailed maps, engraved hand colored, double-page, with title cartouches showing vignettes of topographical and historic scenes, dated 1774-1788. Some maps engraved by Giovanni Marco Pitteri, Giuliano Zuliani, and Pietro Antonio Novelli. Shows political and administrative divisions, cities, villages, landmarks, rivers, lakes, and mountains. Relief shown by hachures. Map of Guinea Orientale repeated twice, Guinea Occidentale is inserted, it was missing from volume IV. Maps of the New World and the Pacific reflect the most recent explorations and discoveries in those areas. Zatta includes 12 maps in reference to the United States ""Colonie Uniti"", dated 1778, which he also published in ""Storia Dell' America Settentrionale Del Signor Abate Raynal"" - see our 5007.000"